ARCADIA >> A man’s body was discovered on a street Friday morning. Lt. Loy McBride of the sheriff’s Temple Station said a passerby reported a “man down” on Sandra and Foss avenues at 10:14 a.m.
Deputies and firefighters responded to the location which is in the unincorporated county area near Arcadia. There were no overt signs of foul play, and the death appeared to be natural, Los Angeles County sheriff’s and coroner’s officials said. An autopsy was planned to determined an officials cause of death. POMONA >> A West Covina man received an eight-year prison sentenced Friday after admitting an arson spree targeting six San Gabriel Valley businesses late last year and early this year, officials said. During what was scheduled to be a pretrial hearing in Pomona Superior Court, David Lin, 43, pleaded “no contest” Friday to five counts of arson of property and one count of arson of an inhabited structure, according to Los Angeles County District Attorney’s Office spokeswoman Sarah Ardalani. The outcome was the result of a negotiated plea arrangement. Judge Salvatore Sirna sentenced Lin to eight years in state prison and ordered him to register as an arson offender for life, officials said. Lin was arrested Feb. 3 after investigators linked him to a series of seven arson fires that ignited primarily inside the bathrooms of San Gabriel Valley businesses since December, Los Angeles County sheriff’s Sgt. John Hanson said at the time. No one was injured in the fires, at least one of which caused thousands of dollars worth of damage. The fires were reported in December at the Guppy House restaurant in Hacienda Heights, as well as the Rolling Wok restaurant in Rowland Heights. Two more similar fires broke out in January at L & L Hawaiian Barbecue in Walnut and at Office Depot in Rowland Heights, investigators said. The final three fires were reported the day of Lin’s arrest at a McDonalds, a Del Taco and Ten Ren’s Tea Time, all in Rowland Heights. A motive for the bizarre crime spree was not clear, prosecutors said. Officials described Lin as a former West Covina resident who had been living in his car at the time of the arsons. 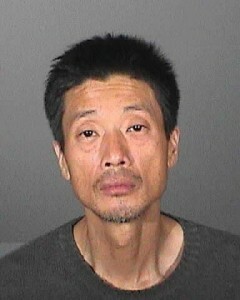 PHOTO of Davin Lin courtesy of the Los Angeles County Sheriff’s Department. SUNLAND >> A Rosemead woman died Thursday after her car crashed into a parked big rig alongside the 210 Freeway in Sunland, authorities said. Valerie Lovio-Gonzales, 59, was pronounced dead at the scene of the 4:15 p.m. crash on the eastbound 210 Freeway, just east of Sunland Boulevard, Los Angeles County Department of Coroner Assistant Chief of Operations Ed Winter said. She was at the wheel of a 2012 Nissan Altima when it struck the rear of a 2015 Freightliner tractor-trailer that was stopped on the right shoulder, California Highway Patrol officials said in a written statement. The cause of the crash remained under investigation, however officials said alcohol did not appear to be a factor. Anyone with information was asked to contact Officer Fan of the CHP’s Altadena office at 626-296-8100. LA HABRA >> Police and worried family members are seeking a 14-year-old La Habra girl who went missing Wednesday afternoon, officials said. 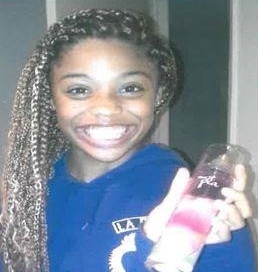 Morgan “Mo-Mo” Starr Hambrick was last seen about 2 p.m. in the 900 block of Las Lomas Drive, La Habra police officials said in a written statement. Though she has run away from home in the past, Hambrick has never been gone for more than four hours, police said. She requires medication for a medical condition. It was unclear whether she had any money with her, and she does not own a cell phone. Hambrick was described as black, 5 feet 1 inch tall and 79 pounds. She has gold and brown hair, worn in braids, and brown eyes. She wa last seen wearing a pink beanie, tan shorts and black high-top sneakers. Anyone with information was asked to contact Sgt. Jose Quirarte at 562-383-4300. PHOTO courtesy of the La Habra Police Department. Reputed Bloods gang members Larry Darnell Bishop, 23, of Chino, and Jerron Donald Harris 27, of Pasadena, have been charged with murder and other crimes in connection with the Dec. 25, 2012, shooting that left 49-year-old Victor McClinton of Pasadena dead in the 1900 block of Newport Avenue in Pasadena. After a trial that lasted more than a month, the Los Angeles County Superior Court jury hung with respect to both defendants, Los Angeles County District Attorney’s Office spokesman Greg Risling said. Judge Curtis Rappe declared a mistrial. It was unclear Thursday whether prosecutors would pursue a second trial. The two defendants were each charges with murder with special circumstances of discharging a firearm from a moving vehicle and murder to benefit a criminal street gang, attempted murder, two counts of shooting at an inhabited dwelling or vehicle and possession of a firearm by a felon. 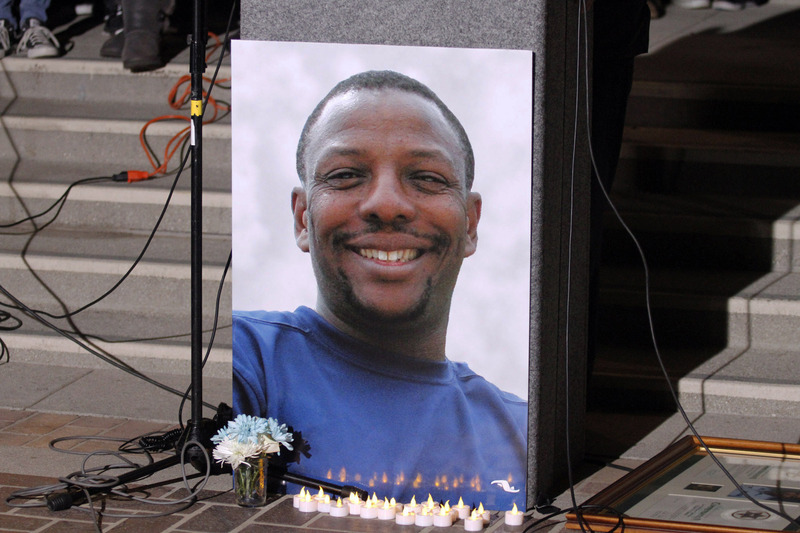 McClinton was a father of two, a former Los Angeles County Sheriff’s Department law enforcement technician of 18 years and a youth coach who founded the nonprofit Brotherhood Community Youth Sports League in Pasadena. BALDWIN PARK >> The cause of death of a 54-year-old Duarte man found unconscious in front of a Baldwin Park grocery store remains under investigation, though the man suffered from several maladies and foul play was not initially suspected. Paramedics pronounced Raul Ygnacio Acuna dead shortly after he was found lying unconscious in front of Food 4 Less, 3000 N. Baldwin Park Blvd., Los Angeles County Department of Coroner Assistant Chief of Operations Ed Winter said. An autopsy had been performed, but a cause of death was yet to be determined pending the results of additional tests, Winter said Thursday. Though listed in coroner’s documents as transient, niece Rachel Chavez said her uncle was a lifelong Duarte resident. Family members were awaiting word from the coroner regarding exactly what happened to Acuna, she said. They knew only that he had gone for a walk after leaving the nearby Kaiser Permanente hospital. Acuna is survived by son Nicholas Acuna; mother Linda Olsen-Acuna; siblings Angela Acuna Hernandez, Eddie Acuna Jr., Cynthia Marin, Alex Acuna, David Olsen; and many nieces and nephews, Chavez said. WEST WHITTIER >> Deputies shot and wounded a man late Wednesday in a residential neighborhood just west of Whittier, officials said. The shooting took place about 11:40 p.m. in the 12000 block of Rosehedge Drive, in the unincorporated county area of West Whittier, Deputy Kelvin Moody of the Los Angeles County Sheriff’s Information Bureau said in a written statement. No further details were available early Thursday. Detectives from the Sheriff’s Homicide Bureau are spearheading the investigation. 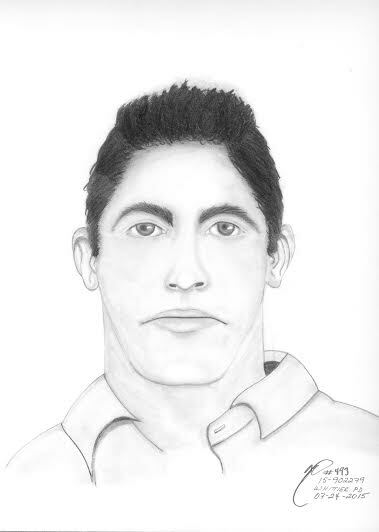 SANTA FE SPRINGS >> Police have released a composite sketch of a man who exposed himself to a woman and tried to kidnap her as she walked along Pioneer Boulevard earlier this month. The victim, a 57-year-old Downey woman, escaped with only minor abrasions following the failed abduction, which took place about 7:45 a.m. July 5 in an alley along Pioneer Boulevard, just north of Houghton Avenue, according to Whittier police Lt. Kent Miller. The woman was walking when the suspect called out to the woman from a black SUV, Miller said. The woman managed to pull free and run away. The attacker was last seen driving north on Pioneer Boulevard. Police described the man as Latino, 30 to 35 years old,of medium build, clean-shaven, with short black hair combed backward. ANyone with information is asked to contact Whittier police Detective Kremling at 562-409-1850. SAN DIMAS >> Deputies arrested a man Tuesday after a bizarre incident in which he entered a bank branch on roller blades and asked to “borrow” money before being subdued by deputies and diners at a nearby restaurant, officials said. Scott Baertich, 24, was booked on suspicion of robbery, though the ultimate decision as to what charge or charges he may face will be made by the Los Angeles County District Attorney’s Office, Los Angeles County sheriff’s Lt. Tonya Edward said. The unusual incident began shortly before 11 a.m. at the U.S. Bank, 165 E. Bonita Ave., the lieutenant said. Baertich rolled into the branch on skates and “asked for theme to let him borrow $20,” Edwards said. A clerk handed the man a $20 out of fear and he left the bank, she said. Deputies responding to reports of a bank robbery suspect on roller blades spotted a pair of skates sitting in front of nearby Roady’s Restaurant, 160 W. Bonita Ave., Edwards said. Deputies — aided by customers of the restaurant, which included an off-duty deputy and a retired deputy, wrestled Baertich into custody, she said. Deputies used a Taser to subdue the man. No significant injuries were reported. It was uncertain with prosectors would file a robbery charge against Baertich, as he made no direct threat or demand while inside the bank, Edwards said. He was being held in lieu of $100,000 bail pending a scheduled appearance Thursday in Pomona Superior Court, records show.